If you run a business where you charge by the hour, there is a fundamental limit to your annual turnover based on your hourly rate. Let’s say you could work for 8 hours a day, 5 days a week and 48 weeks a year and you charge £50 an hour. If you were lucky enough to have 100% client bookings, you could earn £96,000 a year. This is not a bad level of income but you might burn out in the process. This also leaves no time for client acquisition, any admin or even a tea break! Those that are lucky enough to have a full client diary end doing their admin and marketing in the evenings and weekends and end up becoming their own employee. There is though a radical and revolutionary way to get more done in less time and, as a result, become more profitable. This method is initially useful where you are billing for work commissioned by the client and not in face to face meetings. When you get confident in the techniques, I will explain how you can pull this trick off in front of a client too! It’s a common misconception that time is fixed. If you’ve ever been in a waiting room with nothing to read, minutes can stretch into seeming hours. Conversely busy weekends can fly by and Monday come around all too soon. What and how we think directly affects the perceived passage of time. Spend time fretting about the past or worrying about the future and you will at least half your efficiency and output right now. On the other hand, when you ’get in the zone’ however, you can double, triple or quadruple your output. 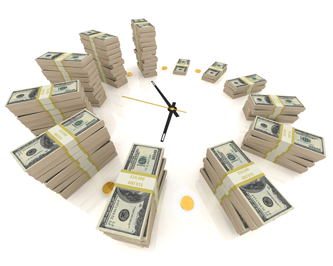 So, rather than increasing your hourly rate, you can keep it the same but more of the same work in less time. The client will be happy too, not least as the quality of the work we do when we are focussed increases several-fold. The secrets of how to pull off this magical feat are revealed in Living Timefully, a revolutionary time management programme. This self study course turns time management on its head. Note that it’s not yet another methodology on how to better prioritise and how to manage interruptions. It shows you how you can change the speed of your thoughts so you can get more done in less time. The proof of how it works is in tasting the pudding but just imagine if it’s true, how could you use possibly use this in face to face interactions? When you learn the simple mindfulness techniques, something amazing happens when you switch your internal time clock, the ’clocks’ of people around you also switch to match yours. So, for example, if you have a non-chargeable sales or project scoping meeting, you can reach consensus in half the time. This way you can get back to billing work more quickly. When you are in a chargeable session with a client they get more from the session and feel they get great value from you. They value their time too so your seeming efficiency, focus and clarity gives you an edge over your competitors. You might even consider putting your rates up when the inevitable testimonials come flying in. So what are you waiting for? As for planting a tree, the best time to start creating more time is yesterday. The second best time is today!